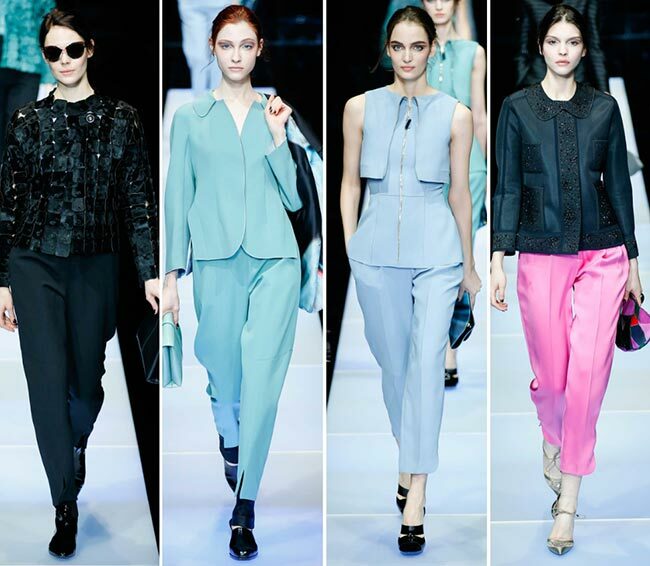 We watched the Emporio Armani fall/winter 2015-2016 collection be presented on the Milan Fashion Week runway but a few days ago. 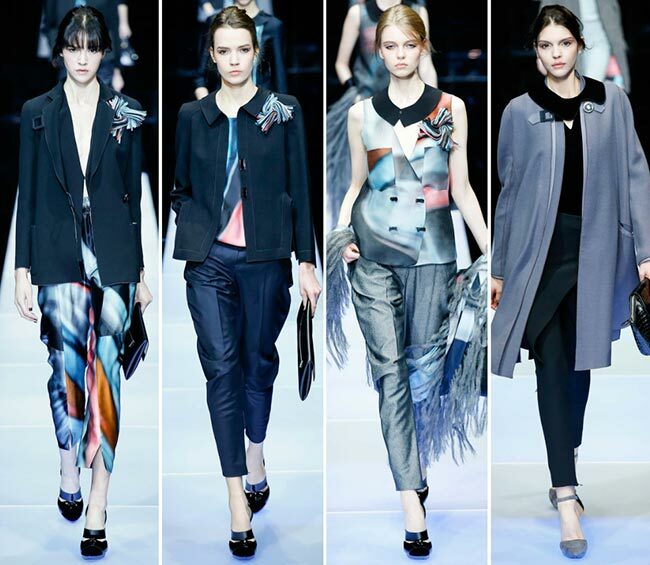 Today, we were served with the original brand, the Giorgio Armani fall/winter 2015-2016 collection. 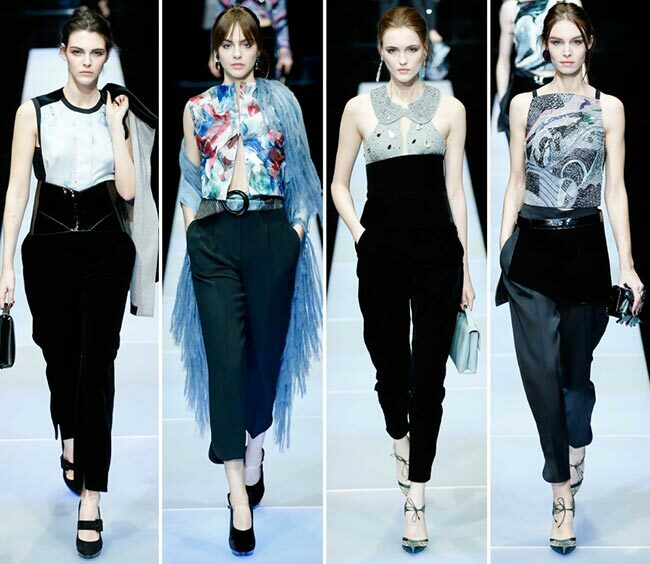 The Milanese fashion house founded in 1975 is a favourite to many, with the Giorgio Armani label offering the higher end specializations in men’s and women’s ready to wear clothing, accessories to match, glasses for different uses, cosmetics in the beauty line, and perfumes that make us more than happy this brand exists. 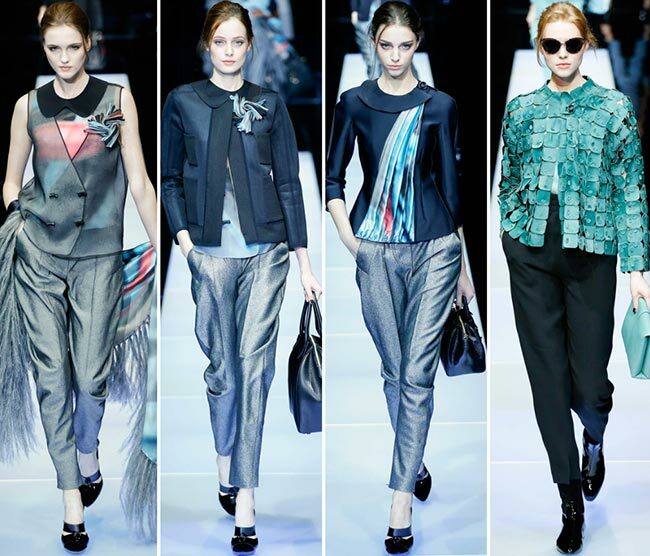 They are only available in the Giorgio Armani boutique, specialty clothiers and select high-end department stores. The logo for this branch is the curved “G’ completing a curved “A’ and forming a circle together. 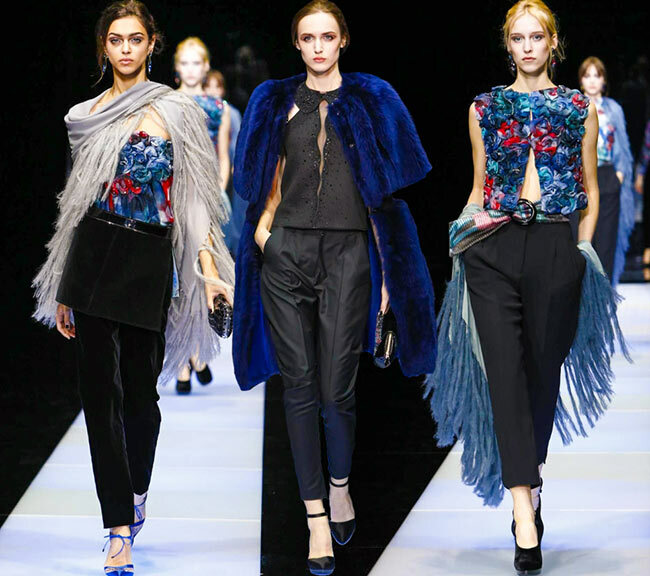 As expected, the runway show was positively breathtaking, with the colors and the pieces, the pantsuits and the jumpsuits, the velvet and the silk, the fur and the feathers. From the sunglasses to the shoes and everything in between, there was nothing not to love about it. 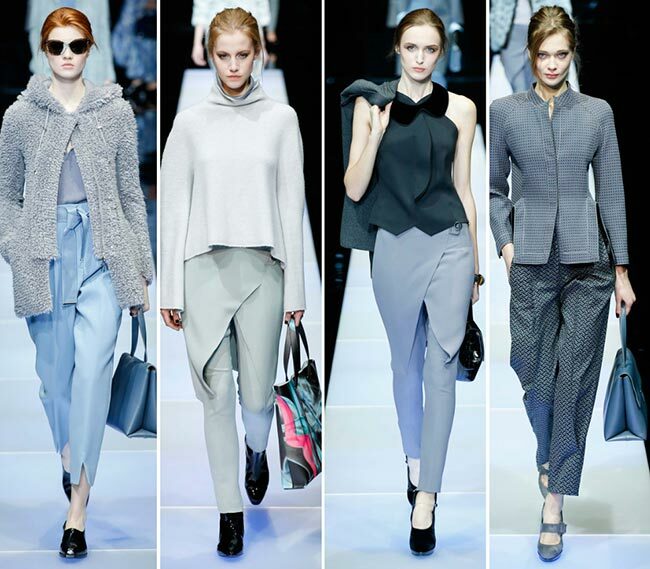 Though, it would have been nice to see some of the season’s trends appearing. We had barely any skirts and few plunging necklines, no slits and barely any of ’70s looks that were screaming out to us. Feathery fringes we did have though and some semblance of keyhole plunges appeared, but for the most part we are looking at a rather tame combination of pieces that brought the focus on the trouser look. 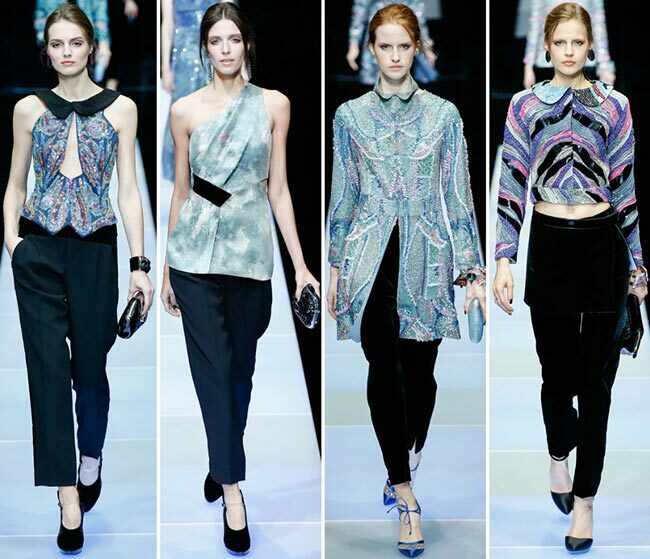 The tie-dye style colorful nuances were also quite appealing, beginning with an asymmetrical plunging V-neckline blazer with a colorful patch on the shoulder and the tie-dye style cropped pants ending just a touch above the ankles, complete with a black clutch and blue and black leather shoes with pretty cut-outs. 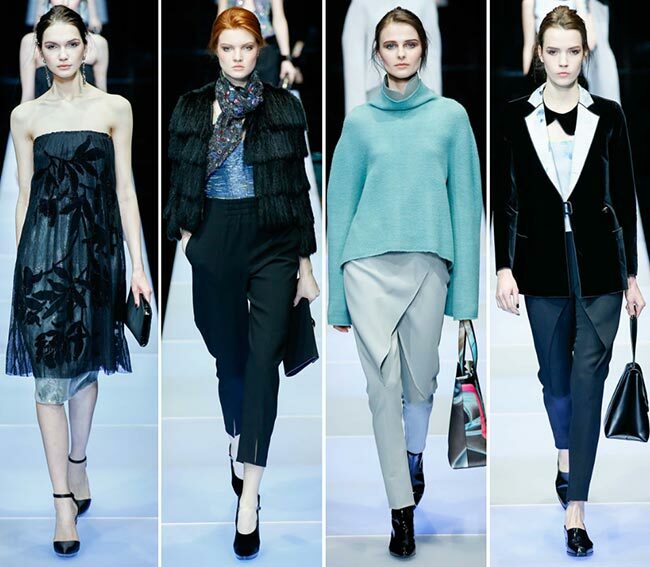 Throughout the Giorgio Armani fall/winter 2015-2016 collection we are given a taste of quite a few different styles and a pretty narrow palette of colors that still manage to inspire an aura that speaks chic and sophisticated rather loudly. We have navy blues and simple blacks, pale coral pinks and deeper greys, there is teal and there is silver, slivers of daring pink and touches of copper. 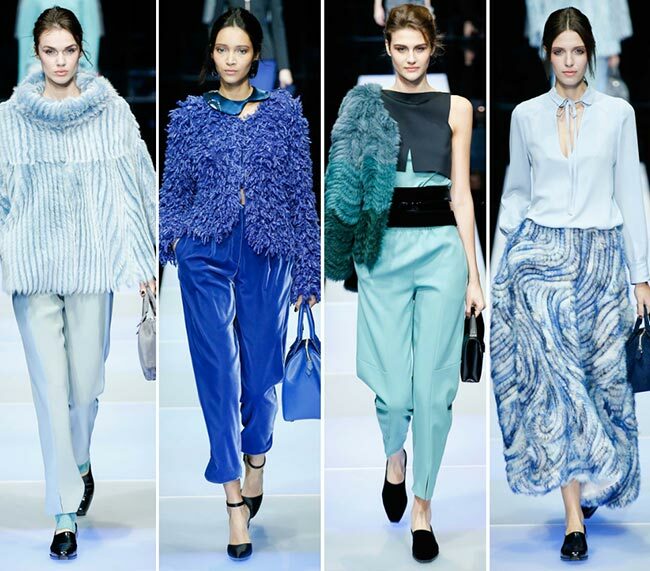 There is even some tanzanite and a more violet hued undertaking in color blocks, while the pale blues and swirling sky colors give us a semblance of peaceful moments to be had while wearing the Giorgio Armani pieces. The aqua coloring of one of the loose fitting turtleneck sweaters draws us in, while the darker teal palettes of one of the jackets gives us better reason to stare. While we are head over heels in love with the velvets included in the collection, we find ourselves raising a brow or two at the electric blue velvet ensemble with the feathery jacket pulled over crop top set, the high waist of the wide legged pants not quite as attractive as hoped, though the ankle cropping suits it best, particularly with the blue soled black ankle strapped D’Orsay platforms and the matching electric blue leather handbag. 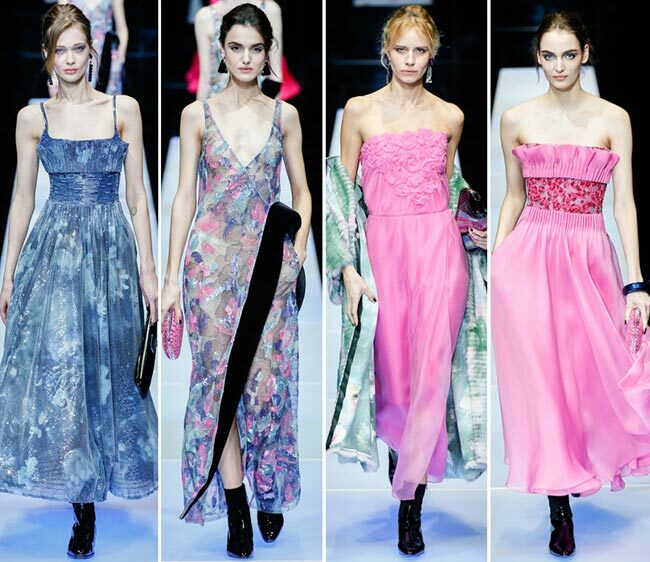 Armani always is one of the best on the runways, but we might end up steering clear of the hot pink seamed trousers during the autumn and the winter seasons.